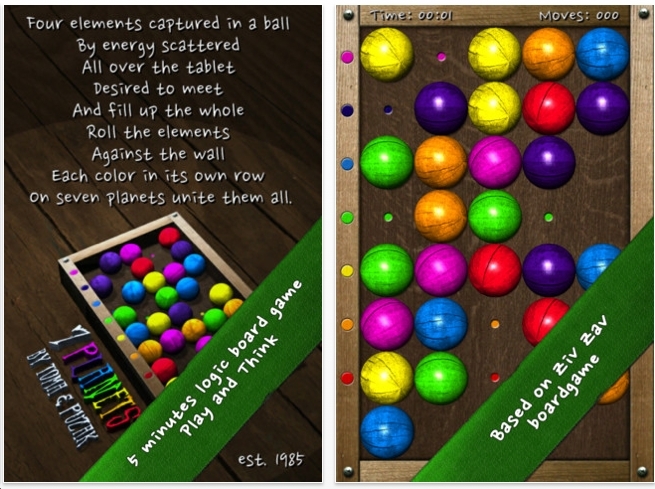 The object is to slide the balls by rows and columns so that all the violet balls are at the top, then the dark blue, blue, green, yellow, etc. When you swipe, all the balls in that row will travel as far as possible. It's not hard. However, young puzzlers should definitely feel challenged. There is a leaderboard to compare your time with the world at large. I have not played the harder levels that have wooden blocks that are fixed in random places. But I have played it 4 times. Probably the most interesting thing is the move counter. If the balls are all randomly placed at the start, what is the minimum # of moves that will solve it? I learned about 7 Planets from Apps Gone Free. I don't know how long it will be free, so give it a shot. Send e-mail to support@7planets.com and I will send you promo code. I have 7 promo codes for the readers of this great blog.